Many may not be aware that the Piping Plover (Charadrius melodus) is the rarest creature living and breeding at Georgica Pond. We’ve all heard about this small shorebird and get annoyed with it for closing the beach, but how many of us really know what they look like and why they are so endangered? Here’s a quick overview of the Piping Plover and the Least Tern (Sterna antillarum) who it often co-habits the beach with. The Piping Plover is usually loyal to its mate and the sexes share in the rearing of young. They generally return to the same stretch of beach in early to mid-March and by May they lay their eggs on the sand well above the high tide mark or at the edge of the dune grass. Incubation takes 25–31 days. 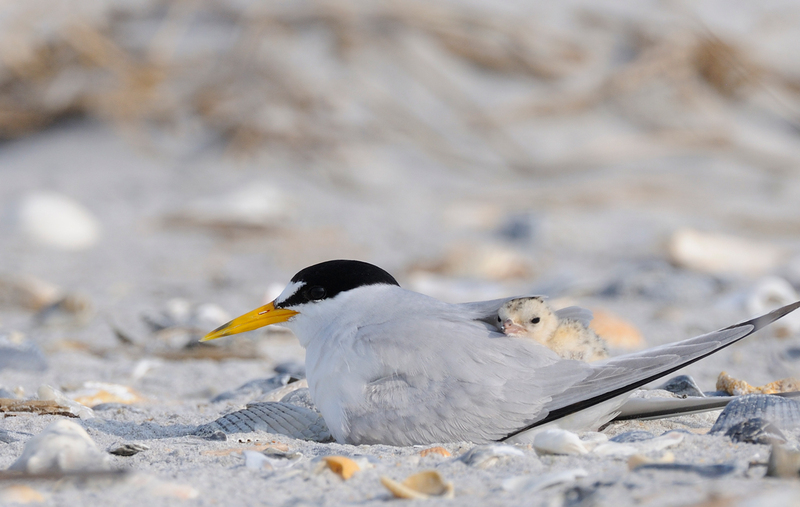 When the chicks are fledged (able to fly—in about 28–35 days) the family flies non-stop to Florida or the Bahamas and other Caribbean Islands for the winter. While at Georgica Pond they feed on crustaceans, mollusks, worms and insect larvae. They forage along the edge of the water, high tide line and beach. 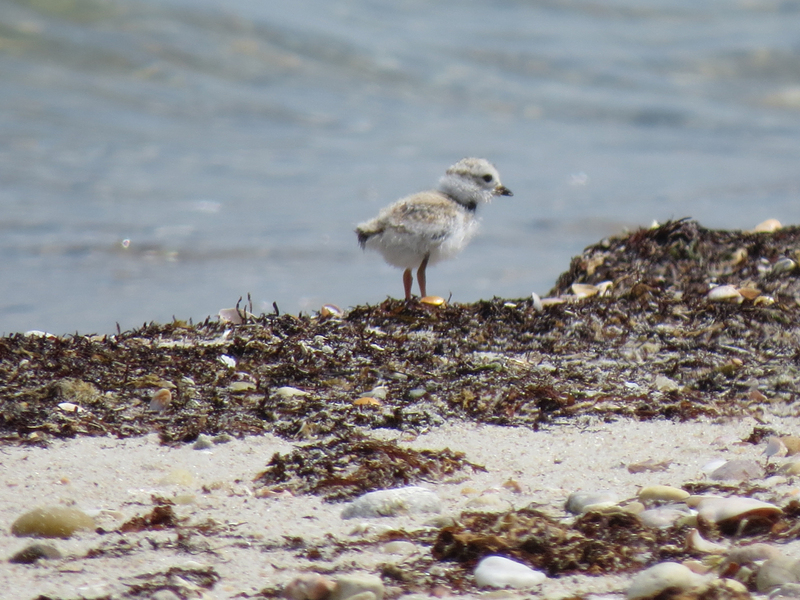 The Piping Plover is very small and well camouflaged. They are hard to see unless they start to scoot along the sand usually alone, sometimes in pairs. They make a pipe organ-like peep sound which can alert you to their presence. Their Latin name refers to the charming sound they make. This year there are five pairs of plovers nesting at Georgica Pond with five chicks fledged so far. There are also 12 least tern chicks fledged so far. Approximate Number in New York: about 200 breeding pairs. Approximate Number in New York: about 3,000 breeding pairs. Why are these birds so rare? Because they nest on beaches during peak human beach use, they are in direct conflict with many of our summertime activities. Due to coastal development, much of their historic range has decreased and their habitat has been degraded. And while the plover’s camouflage and the least tern’s dive bombing behavior during nesting season do help keep people away, it is not enough against the onslaught of trucks, fireworks, people, dogs and natural predators such as gulls. To help the Piping Plover and Least Tern at Georgica Pond, the Town of East Hampton’s Natural Resource Department fences off the nesting area every spring. They may also put a fine mesh cage over the nests called a predator exclosure to ward off predators. It is imperative that the East Hampton Town Trustees open the pond prior to the start of the April 1 nesting season window so that opening of the pond does not interfere with nesting. Because they are protected by the Federal Endangered Species Act, the Piping Plover nesting period must be protected from other activities. Sometimes this can conflict with the East Hampton Town Trustees traditional opening of the pond. Such is the case this year. If plovers successfully fledge their young on the first nesting attempt, they may often head south as early as late July. 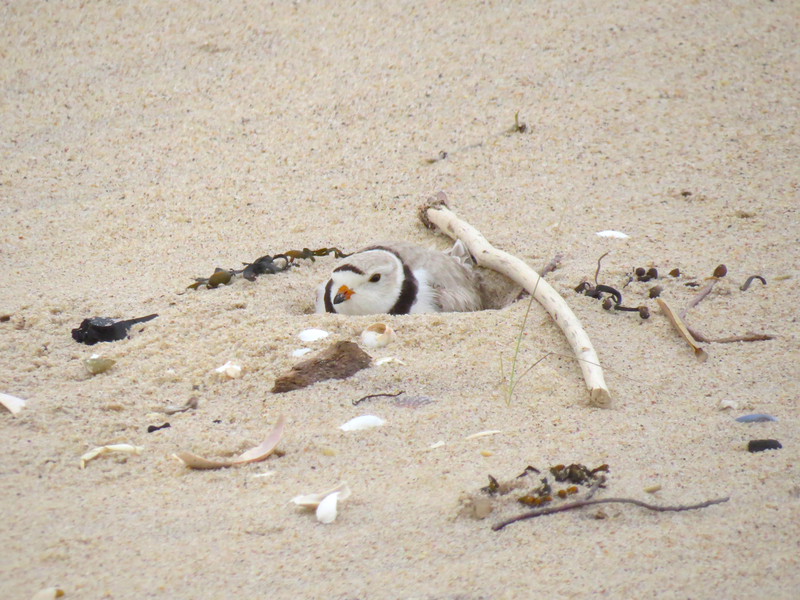 But if they re-nest after their first nest has failed due to disturbance or predation, their nesting period is prolonged and access to this part of the beach will remain restricted. Keeping the nesting area protected from disturbance is something everyone around the pond can participate in. Inform you children and guests to stay away from the nesting area. Beach parties, beach driving and fireworks should all stay far from the fenced and posted nesting areas as should all dogs. Never leave litter or any food on the beach—this attracts predators. 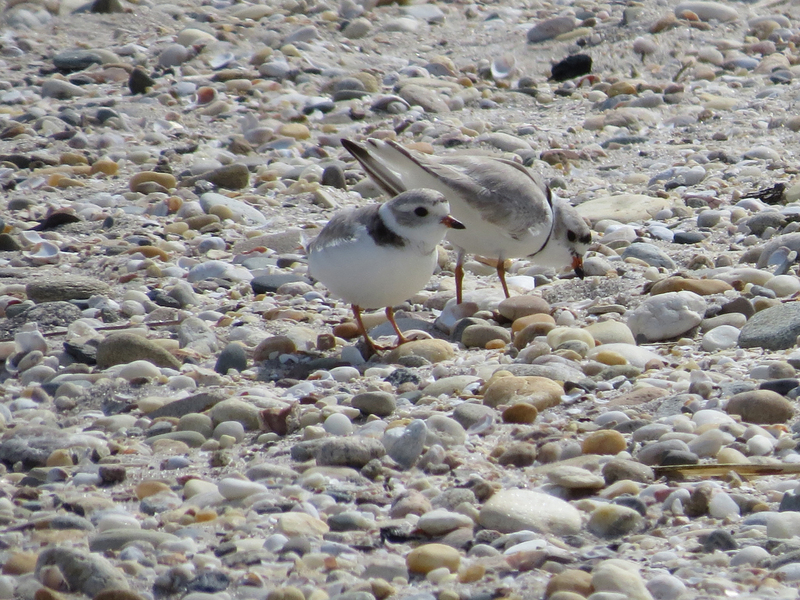 Living in harmony with the Piping Plover is possible; it takes thought and care. Thriving plovers are an indication of a healthy ecosystem which is what we want for Georgica Pond. All photos: Town of East Hampton.